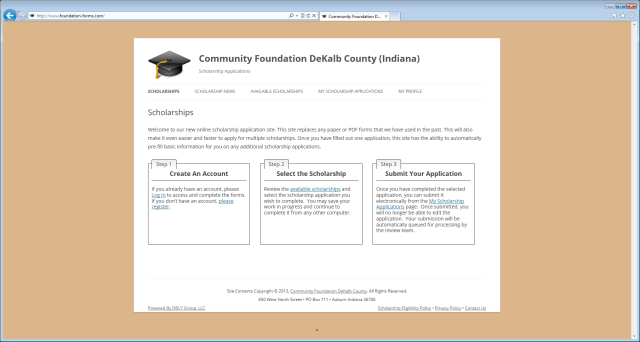 The Community Foundation of DeKalb County is a clearinghouse for many locally-funded scholarships, however maintaining and managing those scholarships was very time consuming, expensive not only in terms of labor hours but also in the massive amount of paperwork that was generated, printed, distributed, and collected. This website eliminates the paper – allowing high school students to find out which scholarship or scholarships are currently accepting applications and allows them to apply for them online. Students can start an application and come back to it later from any internet-accessible computer or smartphone. If a student applies for multiple scholarships over the course of the year the website can pull across the information that they have already provided to simplify and accelerate the process. Once submitted, the system allows a manager to assign multiple reviewers to an application package, and upload and associate grade transcripts. Reviewers enter the results online, allowing for easy tabulation and sorting. Implemented as a custom WordPress plugin and Theme, this site is an example of how we can extend open-source software to meet a business need.